After exploring the remote and beautiful Islands in Panama, and the Central American Countries to the South of us, or coming from the jet-set pace of Cabo san Lucas and her sister Mexican ports, you will find your stay at the Puerto Barillas, to be unique and enriching. We hope that this cruiser’s guide will assist you during your stay in El Salvador. Initial acknowledgement of your arrival provided by the Port Captain’s office. On arrival, your will need to apply for a temporary importation permit for your vessel. Certificado de Permanencia. (akin to a cruising permit but applicable to stored boats as well), is another document required by the Port Captain, valid initially for 2 months from issue and representing additional confirmation of the vessels’ right to stay in El Salvador territory and applied to all vessels staying more than 8 days. If departing El Salvador on your vessel intending to return be AWARE that your paperwork will need to be renewed entirely when you return. Pet owners should also be aware of check-in regulations. PLEASE keep your pets on a leash while in the restaurant area: they can preside only with tacit agreement of the other restaurant users. DO NOT wear expensive jewelry while walking around town. LEAVING YOUR BOAT If leaving your boat unattended make arrangement with someone (approved by the marina) to look after it. We will be happy to recommend suitable caretakers. If leaving the country get a letter from the Marina declaring that your vessel is here so you will not require an outbound ticket on your return to El Salvador. GENERAL NOTES: While we do provide security in keeping with our desire to maintain the informal family ambient, the ‘Club’ (Barillas Marina Club) will not be held responsible for you personally, nor your crew/guests. Neither will the Club be responsible for your property during your stay here. At all times the Captain/Owner remains responsible for all matters concerning his vessel and property (the Club is always ready to offer assistance). PAYING THE BILL: On arrival we will set up an account which should be paid on the First of the Month or prior to departure. To Usulutan: A free ride by Barillas Mini-Van, departs the Marina on Tuesday and Friday at 0900 for Dispensa Don Juan, and departs the Dispensa at 1230 for Barillas; also available for short detours to specialty shops. To San Salvador: Via Barillas Mini-Van, as requested; make arrangements with the Marina Office. To the Airport: Via Barillas Mini-Van, as requested; make arrangements with the Marina Office. Taxi Cab Information; Usulutan is full of yellow taxicabs; transport from town to Barillas costs about $15US; be sure to negotiate a price up front. Bus: All kinds of bus transportation is available, to San Salvador, San Miguel and “other” locations for the adventurous. Buses are more or less clearly marked, and depart from a number of locations near Dispensa Don Juan. Note: for ease of description, we have used the terms “South Main” for the street coming into Usulutan from Barillas, and “North Main” for the street leaving for Barillas. Also, due to missing, illegible, etc street signs, we’ve used the “number of blocks from Dispensa Don Juan” or “Scotia Bank” for directions…(they’re still “approximate, but ballpark”). Banco de America Central 3 Blocks further on from ScotiaBank, (The other side of the Parque Central); very helpful with “card problems” or problems understanding what the ATM is asking you (or what you’re trying to tell it). And many other banks in the general vicinity. Small Batteries: Impressa Repuestos in mid-town, the Barillas driver will take you there. Free Wi-Fi at the Marina; as you get farther down the anchorage, the coverage gets poorer; reception is great in the swimming pool area and the restaurant; there are 115V outlets at each table in the palapas. Solar Panels can be found at Ferreteria El Conecte, which is just one block beyond the Sherwin Williams Paint Store on North Main (just beyond Parque Central); they have a 75-watt model on display, but can get any size panel down from San Salvador. (PrestoMar???) Hull repair, modifying chainlockers, propane tank boxes, etc. Peluquero Richard, walk to ScotiaBank, turn left walk one block, located on the corner. Ferreteria Avila, between La Pirraya and EconoPartes, across from Puerta Oriente; there is an English Speaker here. Oxgasa: Walk past ScotiaBank to Pollo Campero/Da Vivienda, Turn left and walk two blocks to Oxgasa; you will find medical supplies, Stanley, Skil and Bosch hand and power tools, safety gear and shoes, welding machines, cutting and burning rigs, motors, generators, pumps, O-Rings, the list goes on and on…and, they will sell you a new fire extinguisher, or recharge your old one. Trans Express (mail forwarder): Shipping every Friday from Miami (3 days to San Salvador). Pharmacies are everywhere and you will find most of your prescription needs available and reasonably priced. Prices vary considerably among the pharmacies, and even among branches of the same pharmacy. It pays to shop around. Many drugs that are prescription only in other countries can be purchased over-the-counter in El Salvador. Most pharmacies have reference books to find a generic equivalent of name-brand drugs. Please draw up a written agreement before starting any major project. Be wary of the lowest quotation since when a project starts it may be difficult to maintain the original agreement. Dispensa Don Juan: The Barillas Mini-Bus destination, “US-Style” Supermarket, is quite fully stocked. Dispensa Familiar; on “South Main”, just across from the new vegetable market; veterans of the Rio Dulce will recognize this store. Confecciones Granados (it says “Almacenes Granados” on the portico), 3 Blocks west of Dispensa Don Juan, on North Main; in addition to fabrics, cushion foam, and other items, they repair sewing machines, and have a large supply of Polyester thread, in an assortment of colors. Libreria Montenegro: All kinds of paper and office supplies; about 5 blocks West of Dispensa Don Juan, on South Main. Ice Cream Parlor: There are a number of these around town, the Heleria Niveria right next door to Dispensa Don Juan is a welcome place to wait on the departure of the MiniBus. Bazar Nelson; pass by Scotia Bank, take a right at Payless Shoe Source, walk a few doors up the street, the Bazar is on the right; Alterations, etc, Singer treadle sewing machine, prices very reasonable. There are numerous kiosks that can sell you minutes, but for full service, computer modem “sticks”, etc, go to the main store. Phone cards can be purchased in Pharmacies, grocery stores and from street vendors wearing advertisement aprons. El Salvador Country Code: ____ . A call can be made to the U.S. or other countries using one of El Salvador’s long distance direct-dial companies (005+1+area code+number). A cell phone can be purchased at many places. You can make international calls using the internet through the Skype service. 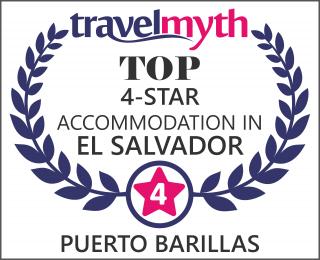 If you are planning to travel within El Salvador, it is important to keep in mind that while security has greatly improved throughout much of the country, some journeys by road continue to present a risk! It may be safer to fly, and/or make arrangements with a tour operator. Located adjacent to, and affiliated with, Taller Merced (the machine shop), this shop can weld mild steel, stainless, aluminum, and also work with brass or bronze. Puerto Parada is about 5 miles south of Usulutan (the road starts at the intersection near Ferreteria 2M and terminates at Puerto Parada). At the Port, you will find a ramp with 15 or so pangas, which ferry people and material to and from the various islands in Bahia Jiquilisco; in addition to the transportation activity, there is a small tienda, a couple of small restaurants, and some very friendly local folks; some English spoken here. Land your dinghy on the small ramp beyond the nest of moored pangas. As an additional attraction, when returning from the Port, the first large river, on the west side of the main river to Barillas, cuts through the mangroves South of the Marina and comes out on the “shrimp boat side” of the estuary; it is a very scenic ride. This river can be identified by a large fishing shack on the North side of the entrance; the river is wide, deep and winding.